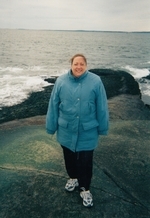 Kimberly passed away suddenly at home on Friday April 5, 2019, at the age of 57 years. Beloved wife of Andy Beaulieu. Loving mother to Ryan Cloutier and Sean Beaulieu. Cherished daughter of Shirley Sanford (René) and the late Alvin Pultz. Kimberly will be sadly missed by her sister Debbie Pangiotopouls (Louis). Family and friends are invited to visit the Kemptville Chapel of Hulse, Playfair & McGarry, 805 Prescott Street, Kemptville on Monday, April 15, 2019 from 11 am to 12 noon. A Funeral Service will be held in the Chapel at 12 noon, followed by cremation. In lieu of flowers donations may be made to the Ontario SPCA Leeds and Grenville Animal Centre (800 Centennial Road, Brockville, ON K6V 7E6, Phone:(613) 345-5520).